Higher Trenowin Farm lies between St Ives and Penzance and is the family run farm of Bridgette and Steve Clamp. 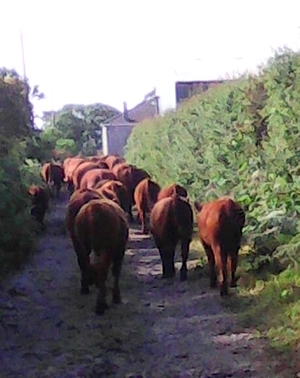 Our Red Ruby Devon beef is born and reared here at Higher Trenowin, fed on a grass diet so the meat is high in Omega 3 oils. We air hang our beef for 3 weeks with Himalayan rock salt to help develop the fantastic flavour. We also have Jacob lamb, which being a native breed like the Devon, mature a little slower but has fantastic flavour. The Farm Shop opened in April 2006 and we specialise in a small, high quality range of fresh produce as well as our own beef and lamb, which we supply to the public as well as local restaurants in the area. We also sell local pork from which we make our own sausages and cure our own bacon. For those who are unable to come to our Farm Shop, we can bring our meat to your door. See our Meat by Mail page for a range of meat boxes that we can offer you by mail order. We can also put a bespoke box together, subject to what is available. Your order will be delivered in strong poly cartons with ice packs. All the meat is vac packed and clearly labelled. The weather has turned a little colder so Steve and I made the decision to wean most of the 2017 calves from their mother's. We have held off longer than normal as the weather has been so mild and we were afraid that when we put the calves into the sheds that the heat and stress would bring on pneumonia, an ailment that we are constantly looking out for when cattle are housed. We still have the yearling and in-calf heifers out in the fields which get a feed of hay every day to supplement the poor grass at this time of year. I am please to report also that there is a good sized covey of Golden Plover on our top pastures - a sure sign that winter is here.